It’s time to hand out the newly prestigious Tavern of the Taeguk Warrior 2013 Year End Awards! Dozens, and sometimes hundreds of people voted for over the last few weeks in numerous categories. Who will take home the prize? In 4th place is Ulsan manager Kim Ho-Gun, who saw a K League title slip from his fingers in the last two games of the season, losing to Busan IPark and then Pohang Steelers in cruel fashion. Our voters though, spared him the indignity of picking up this award, and he received 0 votes. In 3rd place is Arsenal striker Park Chu-Young with 10% of the vote. Park made 11 appearances for Celta Vigo last season (only four starts), and just one appearance for Arsenal this season. The runner up for the Bidone d’Oro is Suwon goalkeeper Jung Sung-Ryong, who received 20% of the vote. Jung went from reliable, if unspectacular keeper, to just plain unspectacular. Some horrendous mistakes were made for club and country which sees his number 1 shirt come in jeopardy. And . . . with a whopping 70% of the vote, the inaugural winner of the Bidone d’Oro award goes to . . .
CHOI KANG-HEE! Yes, the current Jeonbuk and former national team manager is a truly deserving recipient of this award. As national team boss he managed to wreck relations with key overseas squad players, make stupid comments about blood types, and take the team’s playing level to a new low. Injury saw him fade from view a bit, but Hong Jeong-Ho came back strong in 2013 with Jeju United, the national team, and now Augsburg. But perhaps a bit too known, and he came 4th with 5% of the vote. In 3rd place with 7% of the vote is defensive midfielder Han Kook-Young. Han broke out against Brazil and Mali, but then injury forced him to miss the last two friendlies. In 2nd place with 35% of the vote is Kim Bo-Kyung. The Cardiff midfielder had a strong season with the Bluebirds as they earned promotion to the Premier League. Kim also emerged as a strong player for the national team. But, it wasn’t enough, and in the end the breakout player of the year award goes to . . .
HA DAE-SUNG! The FC Seoul midfielder earned many plaudits as he led FC Seoul to the AFC Champions League final, and was a key player at the East Asian Cup in the summer. Five candidates for this award, and in 5th place was army team Sangju Sangmu (3% of the vote). The army team earned promotion back to the K League Classic this past year. In 4th place was the U-19 women’s team which won the AFC championship (6%). In 3rd place was FC Seoul, who were runner’s up in the AFC Champions League, but a 4th place domestic finish may have cost them with the voters. In 2nd place, with 25% of the vote, was Pohang Steelers. Pohang won the domestic double of K League Classic and KFA Cup. The 1st place winner though is . . . THE U-20 MEN’S TEAM! Who had a strong showing at the U-20 World Cup in the summer. The team advanced out of the group stage before they were eliminated on penalties by Iraq. It was a painful time, but not too bad apparently. In 4th place, with 2% of the vote, was the 4-0 loss to Croatia. Humbling to be sure, but perhaps not so bad when you consider the opposition. Losing to a rival is never easy to take, and the 2-1 finals loss to Japan at the East Asian Cup was painful. But voters put it 3rd, receiving just 5% of the vote. In 2nd was the final qualifying match, that 1-0 loss to Iran where we saw Carlos Quieroz go crazy in celebration on the touchline following his war of words with Choi Kang-Hee. Speaking of which, in 1st place is . . .
EVERY MOMENT UNDER CHOI KANG-HEE! Truly it was a painful half year of 2013 under the former national team boss. The team seemed to go nowhere, and it showed. Congratulations Mr. Choi, our first double winner. People expected it to be a relative cakewalk for Brazil when they came to Seoul in the fall, and while the Samba Kings walked away with a comfy 2-0 win, Korea’s warriors battled and fought them for 90′. A good moment, but not great, 4th place in our poll with 1%. We may have lost to Iran 1-0, but the team still managed to get that second auto qualification spot. Qualification was all that mattered in the end, but it wasn’t enough of a moment to come higher than 3rd in our poll with 11% of the vote. Fans were hoping for a good next manager, and they got a good one in Hong Myeong-Bo. His start has had some bumps, but it’s much better than the starvation under Choi. Hong’s hiring comes 2nd with 25% of the vote. And the winning moment is . . . WHEN CHOI KANG-HEE DID NOT RENEW! Wow, a hattrick of awards for Mr. Choi, quite a feat. The relief when it was announced that Choi would not be renewed, was palpable. It never seemed likely, but all were satisfied when they heard. 63% of the vote said that this was the best moment of the year. Could Choi Kang-Hee win a fourth award? No, sorry. Only 1% voted for Choi’s navigation of the final qualifying round as best manager. Receiving 20% of the vote is Choi’s successor, Hong Myeong-Bo. Hong has certainly improved the team, but draws are far too common thus far. FC Seoul’s Choi Yong-Soo is 2nd with 35% of the vote. He didn’t get Seoul to defend their domestic crown, but a surprise run to the finals of the AFC Champions League got him plenty of respect. And the best manager is . . .
HWANG SUN-HONG! Receiving 44% of the vote is Pohang’s double winning manager. Little needs to be said about Hwang, who has assembled a quality, hard working side of Koreans. K League Player of the Year – Given to the outstanding K League player. While there were no real stars in Pohang’s side, one key player was Lee Myeong-Joo who served as the team’s engine. He’s not particularly flashy, and perhaps that hurt him a bit with voters, who only gave him 10% of the vote. In 3rd was the joint top scorer in the league, Kim Shin-Wook. Tied with him on 23% is Ulsan’s breakout young keeper Kim Seung-Gyu. But neither could come close to the almighty . . .
DEJAN DAMJANOVIC! The powerful FC Seoul striker was key to Seoul’s finals run, and once again was amongst the top scorers in the league. Unfortunately, the Montenegrin will be moving over to China next season. Guangzhou Evergrande swept to a third successive Super League title and a first AFC Champions League title, and Kim Young-Gwon was at the heart of a stingy defense. But perhaps the imbalance between teams came to voters minds, and Kim received just 4% of the vote. Tied with Kim is former Swansea and current Sunderland midfielder Ki Sung-Yueng. Ki was key in helping Swansea lift the League Cup last season, and has established himself as an important piece of the Sunderland set up. A rocky offseason though may have hurt him. In second place with 6% of the vote is Kim Bo-Kyung. As mentioned earlier, Kim was vital for Cardiff and established himself as stiff competition with Koo Ja-Cheol in the national team. The run away winner though, with 87% of the vote is . . . SON HEUNG-MIN! The former Hamburg ace and now Bayer Leverkusen attacker has truly cemented himself in Korea’s hearts and minds. A late winner against Qatar, and key (and spectacular) goals for club have made Son the main part of Korea’s attack. Congratulations to all of our winners, and thank you to all who voted! What a year for the Taeguk Warriors! Maybe I’m in the minority, but… I just don’t get the hatred for Choi Kang Hee. True he was an ineffective coach. However, when he was brought on, he saved the team by beating Kuwait and sending them into the final round of qualification. 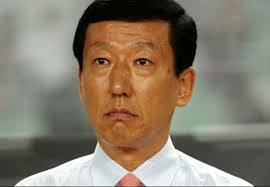 Cho Kwang Rae actually started Korea’s downward spiral (remember the 3-0 loss to Japan and the 2-1 loss to Lebanon?). I get that Choi Kang Hee said dumb things, and the whole incident with the Iranian coach was just awful. And I get that he was not the right coach for Korea. But it seems people want to blame him for everything. From my perspective, things haven’t improved THAT much with Hong Myeong Bo. He’s gotten one significant win (a friendly against Switzerland in Seoul), but honestly that’s just not much. If you want anyone to blame, honestly the players on the team have to improve and they have to be more cohesive. That’s the only solution to Korea’s problems. Pointing the finger at a former coach who was only there about 18 months isn’t helpful for the team. I understand where yr coming from, but as I saw it, the team under CKH had zero tactics other than play the long ball to Kim Shin wook. It was truly shambles and they were extremely lucky to qualify. The Win-loss-draw column under HMB may not look spectacular, but given the circumstance and the time crunch he’s had, he’s done very well. Improvements:the team form and dynamics have had a 180degree turnaround. There is evidence of a much improved passing game. There’s cohesiveness and flow. HMB can potentially lead the team into round of 16, and while I thank u for yr comment, I believe CKH has done much to set back the KNT and that HMB has had limited time to undo that. I agree with you to a point. The hatred for Choi Kang-Hee probably does go a bit extreme at times, but he was piss poor. Things with Hong have improved quite a bit. It may not translate to results yet, but I think that has more to do with how much “fixing” Hong has had to do to get the team back to a level close to where it was when Cho was fired and Choi came in. The team’s mood is much better, the defense is semi-solid, and the midfield is clicking a bit better. Certainly there are still problems, but the last few months have definitely been a step in the right direction. Ultimately, the KFA is responsible for being too reactionary and firing Cho Kwang-Rae without a clear replacement in mind. It is worth remembering that Choi never really wanted the NT job and admitted he wasn’t good enough. Choi Kang Hee’s play and tactics were very very horrendous. I watched nearly every match of the 2014 World Cup Qualifications and the overall play of the Korean national team under Choi Kang Hee kept making me so angry because Korea kept losing the ball and there were almost no good attacking qualities in his team. Under Hong, I see better possession and more chances created to score. I see more flowing football rather than the Choi tactics in which there are discord among players. Cho Kwang Rae’s stat for the Korean national team is: 18 wins, 5 draws, and 3 losses. ONLY 3 losses with 18 wins. That’s a very good stat if you ask me. You are blaming Cho for his two losses but look at the match between Korea 1-1 Lebanon. Korea WOULD have lost if it wasn’t for a very last minute free kick. not to be rude but honestly, thats something someone who hasn’t been watching the game very long would say. I’m happy to agree to disagree. I don’t take anything as rude, but I only said that because I want to see Korea do well in 2014. Placing the blame on Choi Kang Hee for the team’s performance in 2013 isn’t a step forward, in my opinion. There are a lot of issues that need to be resolved. I appreciate Hong Myeong Bo’s efforts, but I can’t see a vast enough improvement to warrant optimism. If I’m wrong and we do well in 2014, I’ll be happy. At this point, I want to be wrong. Actually your strategy is something I heard about on NPR, some kind of research done that somehow measures happiness. Short synopsis: if you have low expectations, and the results come in way higher than that – you end up happier on, hmm, what I guess is the ‘happy scale.’ and now I’ve shown myself as an absolute nerd. Happy Happy, Joy Joy! Just read that Giroud is out and that Walcott is an uncertainty. Ozil is also out as well as Ramsey. Rosicky is also an uncertainty. And others are out as well. Maybe park will be on the bench? I doubt it. Wenger will probably have Gnabry and Akpom there. Also Podolski is back too I think. I’ll have a listing/preview up in a minute which will go over some of the injury stuff. An idea, but honestly there isn’t a whole lot of concrete corruption evidence. It strikes me more as politics and incompetence. It would be nice if it could be touched on sometime in the future. Not necessarily the corruption or the politics, but whatever is keeping Korea from progressing in international football. The lengths that the KFA took to select CKH as coach was really baffling. It’s obviously behind the fans now, but such decisions need to stop. Honestly a podcast was supposed to be recorded a week or so ago, discussing Korean football in general. The KFA, the K League, etc. Unfortunately it didn’t happen because of travel plans and family commitments. I don’t know when it’ll be recorded as we haven’t been able to set a new date for it yet.